HEADWATER (AUS) (Bay 2012-Stud 2016). 3 wins-2 at 2-at 1000m, 1100m, A$460,800, ATC Silver Slipper S., Gr.2, VRC Kensington S., L, MRC Cactus Imaging 2YO P., 3d ATC Todman S., Gr.2, 4th MVRC AJ Moir S., Gr.1. Brother to SP Fare Well. Out of SW River Dove (MRC Oakleigh P., Gr.1). Closely related to SW First Command (MRC Caulfield Sprint, Gr.2), SW Oneworld (HKJC Jockey Club Sprint, Gr.2), SW Willow Creek, etc. His oldest progeny are yearlings. Prism (f. by All Too Hard). Winner at 1300m in 2018-19 in Aust. Bella Scenica (f. by Congrats). Placed in 2017-18 in Aust. BEL THOR (God's Own). 4 wins from 1400m to 2000m, A$338,200, Seymour Cup, L, VRC Antler Luggage H., 2d VRC Galilee Series Final H., L, Bendigo JC Yalumba Golden Mile, L, MVRC Drummond Golf H., VRC Trevor Dray & Joyann Erskine H., 3d MRC Eclipse S., Gr.3, WJ (Bill) Adams H., MVRC Chandler Macleod H., MRC Polytrack H., 4th Cranbourne Cup, L.
Belscenica (Scenic). 7 wins. See above. Massoni. 2 wins at 1200m, 1400m, A$79,915, MRC Steve Walsh H.
Ozolins - Speedy Pegasus (H.K.). 2 wins at 1400m, 1600m, A$81,138, MVRC Ready Workforce H., 3d MRC Sportingbet H.
Il Migliore. 3 wins at 1000m, 1200m in Aust. Bian Laconic. Winner at 1100m in Aust. BELLONIC (Redding). 7 wins. See above. Belgrade. 10 wins from 1300m to 2200m, A$127,550, BTC Mater Little Miracles H., MRC Gothic H., 3d BTC Higgins Better Painting Management H., VRC Pen Computer Systems Welter H., MRC High Caste H., Raffindale H., Bashka Felika H., Journal H., Yangtze H.
Whiston. 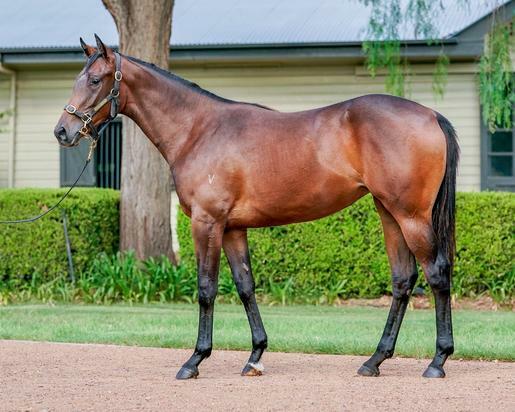 6 wins at 1000m, 1200m, A$179,781, VRC TCL Electronics P., MRC Dark Purple H., VRC Warren Lee & Kenneth Norton H., MRC Snitzel at Arrowfield Stud H., Not a Single Doubt H., 2d MRC Betfair H., 3d MRC Charge Forward at Arrowfield H.
VON COSTA DE HERO (Encosta de Lago). Winner at 2, A$1,124,450, VRC Sires' Produce S., Gr.2, 2d STC Golden Slipper S., Gr.1, VRC Australian Guineas, Gr.1, 3d MRC Caulfield Guineas, Gr.1, MVRC Norman Carlyon S., Gr.2, MRC Caulfield Guineas Prelude, Gr.3, 4th VRC Coolmore Stud S., Gr.1, MRC Blue Diamond Prelude (c&g), Gr.3. Sire. Segusino (Habituate). 6 wins-2 at 2-at 1000m, SAJC Atropine H., Quit & Win H., 2d SAJC Balcrest S., L.
EMLOZZA (Encosta de Lago). 5 wins at 1000m, 1200m, A$231,550, MRC Thoroughbred Club S., Gr.3, SAJC Dermody Lightning S., Gr.3, MVRC Watsons Catering Equipment H., MRC Stan Shannon H. Producer. DOPPIO (Umatilla). 8 wins from 1100m to 2000m in Aust. and Macau, Macau Derby, L, Macau Winter Trophy, L.
MIO DIO (God's Own). 11 wins-1 at 2-to 1250m, A$382,265, to 2017-18, SAJC Spring S., Gr.3, Swan Hill JC Golden Topaz H., VRC Garden View Pavilion H., SAJC MAC Drink Driving? Grow Up H.